Admirably clear, concise, down-to-earth, and powerful—all too often, legal writing embodies none of these qualities. Its reputation for obscurity and needless legalese is widespread. Since 2001 Bryan A. Garner’s Legal Writing in Plain English has helped address this problem by providing lawyers, judges, paralegals, law students, and legal scholars with sound advice and practical tools for improving their written work. Now the leading guide to clear writing in the field, this indispensable volume encourages legal writers to challenge conventions and offers valuable insights into the writing process that will appeal to other professionals: how to organize ideas, create and refine prose, and improve editing skills. 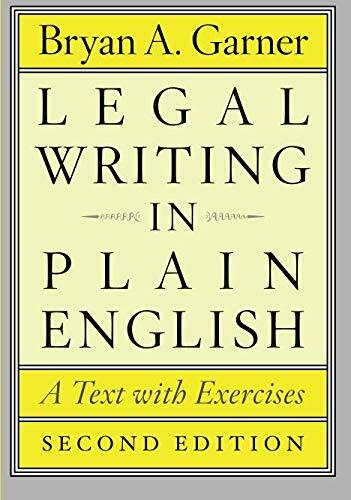 Accessible and witty, Legal Writing in Plain English draws on real-life writing samples that Garner has gathered through decades of teaching experience. Trenchant advice covers all types of legal materials, from analytical and persuasive writing to legal drafting, and the book’s principles are reinforced by sets of basic, intermediate, and advanced exercises in each section. In this new edition, Garner preserves the successful structure of the original while adjusting the content to make it even more classroom-friendly. He includes case examples from the past decade and addresses the widespread use of legal documents in electronic formats. His book remains the standard guide for producing the jargon-free language that clients demand and courts reward.